This document is part of the Environment and Development Series produced by the Environment and Development Division of the United Nations Economic and Social Commission for Asia and Pacific (ESCAP). 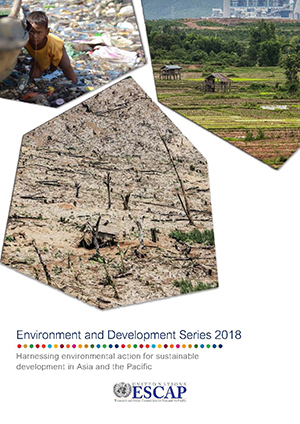 In its 2018 edition, the Series discusses pressing environmental challenges in the region, the potential benefits of environmental action and available solutions in the context of regional cooperation. This paper is based on background documentation developed for the Committee of Environment and Development in its Fifth Session1 from 21 to 23 November 2018. Following a brief overview of key issues, Part A introduces pressing environmental challenges in Asia and the Pacific that endanger social progress and economic prosperity in the region, including those related to unsustainable resource management and natural resource depletion, ecosystem degradation and biodiversity loss, pollution and waste, and climate change. Part B identifies significant benefits and co-benefits of environmental action in four respective key areas, namely promoting resource efficiency, transitioning to a circular economy, conserving and restoring ecosystem services, and climate action. The document provides examples of technical solutions to harness the benefits of environmental action to accelerate progress on achieving sustainable development. To conclude, Part C highlights the value of regional cooperation and of the means of implementation of the 2030 Agenda for Sustainable Development to harness benefits and co-benefits and promote solutions identified. Where available, this document uses the ESCAP Statistical Online Database and United Nations databases. However, trend analysis at the regional level is possible for approximately a quarter of all the global Sustainable Development Goal indicators only (that is, for 64 indicators only), with two or more data points available for these indicators for only 50 per cent or more countries in the Asia-Pacific region. Data is largely missing for most Sustainable Development Goals and targets with a strong environmental dimension (such as Sustainable Development Goals 6, 11, 12, 13 and 14). Additional information on developments and current environmental challenges in the region rely on secondary data, limiting comparability. Increased efforts are required to improve data availability and statistical capacity at the regional level, to inform policymaking, and monitoring and reporting processes.